Imaging Essentials provides comprehensive information on small animal radiography techniques, and the series has addressed the majority of anatomic areas in canine and feline patients, including the head and spine, thorax and abdomen, and the limbs and joints. Avian radiography was most recently covered in our September/October 2014 issue. Access these articles through our online Article Library, available at tvpjournal.com. 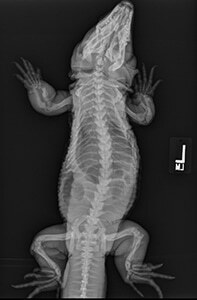 Radiography of reptile patients is routinely used for evaluation of traumatic injuries and the gastrointestinal and reproductive tracts. 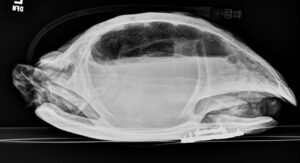 A reptile radiography study typically includes lateral and dorsoventral views. Additional collimated views of areas of interest are obtained in specific species. 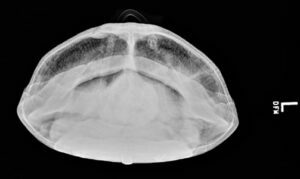 For example, in turtles and tortoises, a craniocaudal view is added to complete the study. Unlike dogs or cats, whole-body radiographs are taken of reptiles in order to visualize the entire coelomic cavity. 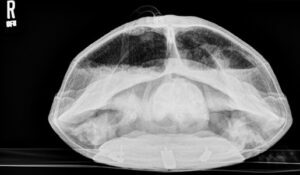 In addition, horizontal beam radiographs of reptiles other than snakes (turtles and tortoises) are important for visualization of the dorsal coelomic structures (lungs). The reptile patient can undergo radiography awake, but general anesthesia is sometimes required to ensure good-quality positioning. Conscious turtles and tortoises have the ability to hold their extremities and head within or close to their shells. In the instance of fracture, sedation or anesthesia may be needed to relax the neck or extremity and isolate it, avoiding superimposition with the shell, for complete evaluation. Tape a figure-8 pattern with 2-inch porous tape over the thoracic and pelvic limbs. Start with the carapace or plastron and tape over a thoracic limb, followed by the opposite pelvic limb, then back to the same thoracic limb. Cross over the shell to the contralateral pelvic limb and then the contralateral thoracic limb, and continue in a figure 8 pattern for at least a second time. To tape the head inside the carapace, place a piece of 2-inch porous tape from the carapace down over the head and secure to the plastron. 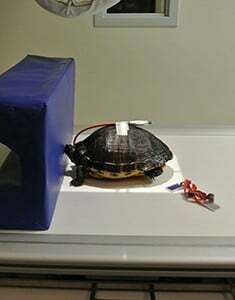 Place a chelonian in a radiolucent plastic tub (Figure 2). Use a similar tub for a snake in order to keep the entire snake spread out for a dorsoventral projection; a tube can be used to keep the snake straight for lateral or dorsoventral projections. Figure 1. 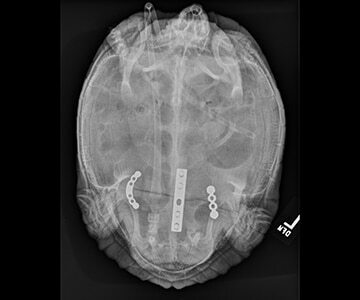 Figure-8 taping of a tortoise; cranial view. Figure 2. Tortoise placed in radiolucent tub for a laterally positioned, horizontal-beam radiograph (A) and corresponding radiograph (B). 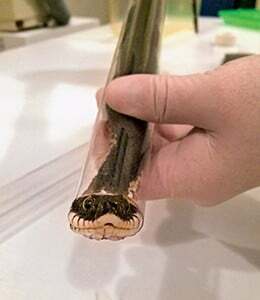 Snake positioned in a tube for either lateral or dorsoventral radiographs (C). 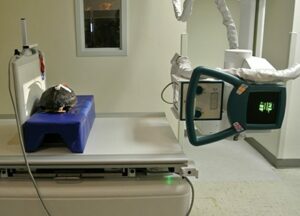 Due to the nature of the coelomic cavity, use horizontal-beam or cross-table projections, if possible, for the lateral and craniocaudal projections of turtles and tortoises. In other reptile species, vertical-beam dorsoventral projections are also acceptable. Technique and exposure depend on the size of reptile. Use an abdominal technique due to the variable opacities of the coelomic cavity. Measure each projection and use appropriate technique as indicated by the technique chart. If using a horizontal-beam method, remember to adjust technique when not using the grid: decrease the mAs by 1/3 if the original technique was set with an 8:1 grid. X-ray table for a film tray technique. Ensure collimation includes the entire shell or body of the reptile—the skull and extremities in addition to the coelomic cavity (Figure 3). Figure 3. Tortoise positioned in sternal recumbency for dorsoventral projection (A) and corresponding radiograph (B). Presence of metal plates and screws are result of shell fracture repair after the tortoise was hit by a car. Place the patient in right lateral recumbency; however, in the instance of trauma or pathologic abnormality, place the affected side closest to the cassette. If possible, use a horizontal-beam or cross-table for the lateral projection. Rotate the x-ray tube head 90° toward the patient. Place the cassette or detector on the right side of the patient—or the affected side—and secure it in place with a cassette holder or sandbag. 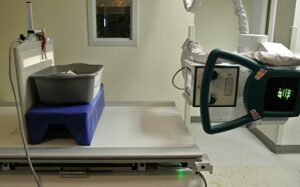 Elevate the patient off the x-ray table, which places the patient as close to the middle of the cassette or detector as possible, by using radiolucent sponges, positioning troughs, or boxes. Center the x-ray beam at midbody of the patient and ensure collimation includes the entire shell or body. Figure 4. 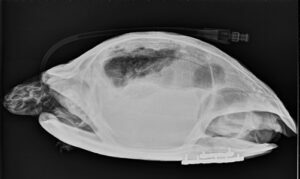 Tortoise elevated off the x-ray table for horizontal-beam lateral projection (A) and corresponding radiograph (B). 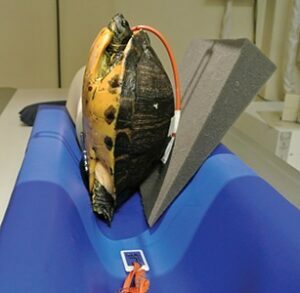 Prop turtles and tortoises in lateral recumbency by using a positioning trough or sponges. Ensure collimation includes the entire shell or body of the reptile. Figure 5. 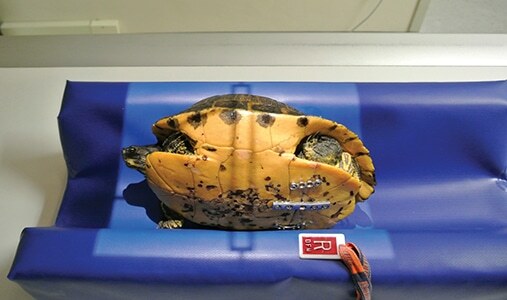 Tortoise placed in positioning trough for vertical-beam lateral projection (A) and corresponding radiograph (B); this approach is used if horizontal-beam radiographs cannot be obtained. Comparison of the radiographs in Figures 4 and 5 demonstrates that horizontal-beam imaging clearly depicts the lungs without superimposition of the coelomic contents. The craniocaudal projection of the turtle or tortoise is used to visualize the left and right sides of the lungs. If possible, use a horizontal-beam or cross-table for this projection. Place the cassette or detector behind the patient and secure it in place with a cassette holder or sandbag. Center the x-ray beam in front of the patient’s head—the patient will be looking at the collimator. Ensure collimation includes the left and right sides of the shell. The left and right hemisphere should appear equal, with the spine superimposed. Figure 6. Horizontal-beam craniocaudal radiograph of tortoise; comparison of the radiographs in Figures 6 and 7 demonstrates that horizontal-beam imaging clearly depicts the lungs without superimposition of the coelomic contents. 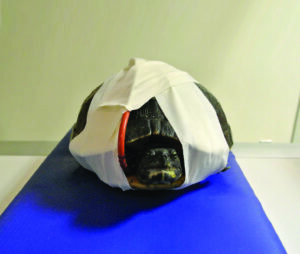 Ensure collimation includes the entire shell or body of the turtle/tortoise. Figure 7. Tortoise placed in positioning trough for vertical-beam craniocaudal projection (A) and corresponding radiograph (B); this approach can be used if horizontal-beam radiographs cannot be obtained. Use the appropriate technique (appropriate exposure and development factors). Obtain the entire anatomic region of interest in the image. 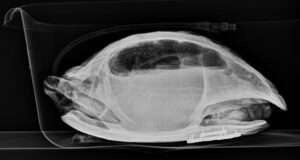 In larger reptiles, sequential cranial to caudal radiographs with the patient in lateral or sternal recumbency ensures complete evaluation. Make sure the anatomic region is positioned appropriately with regard to centering, alignment, and symmetry. Symmetry, especially for musculoskeletal structures, is key to proper evaluation because it assists the interpreter, especially with regard to anatomic differences between species. For the coelomic cavity, all projections—dorsoventral, lateral, and craniocaudal (turtle/tortoise)—should include as much of the patient as possible. For other lizards or snakes, the tail or other portions of the coelom will need to be radiographed separately (Figure 8). Figure 8. Dorsoventral cranial radiograph of a monitor lizard: Two projections are required to image the entire body of this lizard. In some snakes, more than 2 radiographs are required, with the patient in lateral recumbency. Han CM, Hurd CD. Practical Diagnostic Imaging for the Veterinary Technician, 3rd ed. Philadelphia: Elsevier, 2004. Lavin LM. Radiography in Veterinary Technology, 5th ed. Philadelphia: Elsevier, 2013. Thrall DE (ed). Textbook of Veterinary Radiology, 6th ed. Philadelphia: Saunders Elsevier, 2012. Danielle Mauragis, CVT, is a radiology technician at University of Florida College of Veterinary Medicine where she teaches diagnostic imaging. She coauthored the Handbook of Radiographic Positioning for Veterinary Technicians and received the Florida Veterinary Medical Association’s 2011 Certified Veterinary Technician of the Year Award. Clifford R. Berry, DVM, Diplomate ACVR, is a professor in diagnostic imaging at University of Florida College of Veterinary Medicine. His research interests include cross-sectional imaging of the thorax, nuclear medicine, and biomedical applications of imaging. He received his DVM from University of Florida and completed a radiology residency at University of California—Davis.